This is a strategy which we can use when we are neutral to bearish in the Market. We take up this strategy when we feel the price of a stock or index is going to remain range bound with changes to move down. 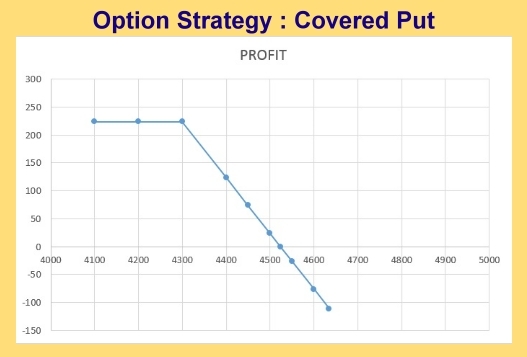 In this strategy we short the stock to cover the put that is written. The Put that is sold is generally an OTM Put. We short a stock because we are bearish about it, but do not mind buying it back once the price falls to a target price. This target price is the price at which the investor shorts the Put (Put strike price). Selling a Put means, buying the stock at the strike price if exercised. When the stock drops, the investor will have the stock put to them at the short put strike price. This covers the obligation of the shares of stock that were shorted. The investor keeps the initial premium received from selling the put. If the stock rises the investor keeps the premium, but they are still holding the short stock obligation and could sustain a loss to close the short. When you think that the markets are moderately bearish. When do we achieve the break-even? We short Rs 4300 Put by selling a next month Put for Rs. 24 while shorting stock of XYZ company. The net credit received by us is Rs. 4500 + Rs. 24 = Rs. 4524. 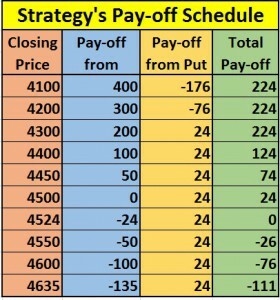 Covered puts enable traders to bring in some extra premium on short positions. Once again, you can keep selling a put against the short shares every month to increase your profit. However, shorting stock is a risky trade no matter how you look at it because there is no limit to how much you can lose if the price of the stock rises above the break-even.